Oak leaf blister is common in spring when cool, wet weather conditions occur. 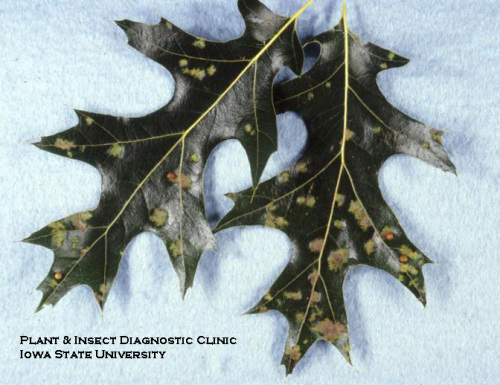 This disease can affect all oak species but red oaks can be more susceptible to infection. Affected trees develop light green, circular, raised areas on the upper leaf surface. These blisters can grow up to one-third to one-half inch, and many blisters can appear on the same leaf. As leaves expand, lesions can turn yellow or brown and may have a grayish color on the underside of the leaf. Severe infections can cause yellowing of the leaf, leaf curling, and early defoliation. Moreover, symptoms can be worse in young tissues but infections are less severe in mature leaves. If this description sounds familiar and you've seen it on your oaks, there's no need to panic. 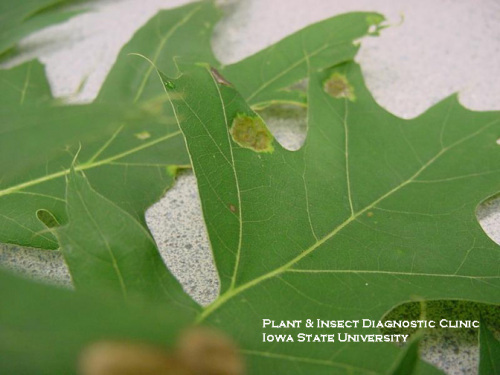 Oak leaf blister might make trees look sick, but this disease will not impact the overall health of trees. There is no need to spray or treat your trees. Instead, promote general tree health by adequate watering and fertilization. Vigorous trees will be less prone to severe oak leaf blister infections. There are blister-like growths on the undersides of ivy geranium leaves. What is the problem?